A traditional wooden church postbox to hold cards. The roof of the church lifts up for you to remove your cards. Great for weddings and christenings. A personalised sign can be included at no extra cost, in your chosen colours. This can either be attached to the roof of the church or provided in a separate frame. 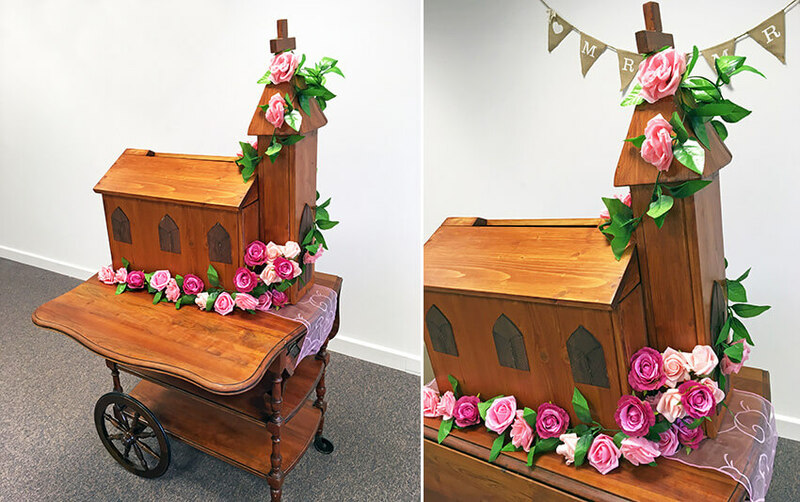 Please note that the flowers and vintage sweet cart shown in the photos are not included in the hire price. This item is hired on a collection-and-return basis from our Swindon base (SN3). You can collect the postbox any time in the 48 hours leading up to your wedding and return it to us with 48 hours of the event’s end. If you book us for your wedding video then you can hire our church postbox for FREE. Woohoo! We’ll also bring it to your venue at no extra charge.